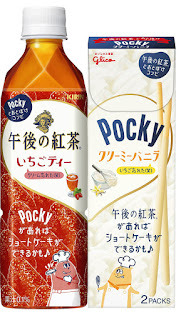 Japanese Tea Story : Strawberry Tea + Creamy Vanilla Snack = !??? But Kirin Beverage Co.,Ltd,and Ezaki Glico Co.,Ltd, have turned into reality. 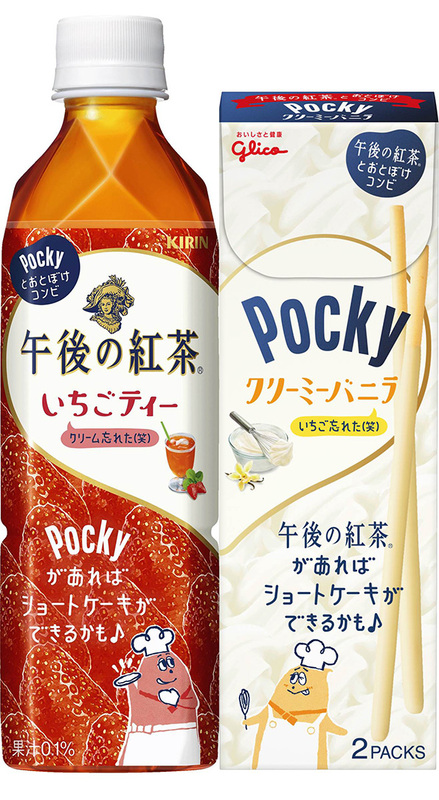 Bottled "strawberry-flavored tea" by Kirin beverage and "Creamy vanilla-flavored Pocky (Mikado)" by Ezaki Glico appeared on the market on February 21st as a collaborative project. They say if you have this snack with this strawberry tea, you will enjoy the taste of "strawberry layered cake" in your mouth! This is not the first time for the two companies to work together. It's the third part of the series since the last two collaborative products were very popular. Does it mean they are good??? Whatever it is....it seems catchy especially among younger Japanese people.